Tanner Industries, Inc. is a family owned and operated business comprised of four (4) Divisions. We operate 13 strategically located facilities that provide product and service to all Eastern and Central Time Zones of the United States, and as far West as Denver. Our company's highest priority is to supply quality product in a safe and efficient manner, and as members of the National Association of Chemical Distributors we have implemented the RESPONSIBLE DISTRIBUTION PROCESS. Responsible Distribution is a quality assurance program dedicated to protecting the health and safety of employees, communities, and the environment. Tanner Industries, Inc. is a third generation, family owned and operated distributor of anhydrous and aqua ammonia whose headquarters are located in Southampton, PA. The roots of our family business date back to December 31, 1954 when Lawrence Tanner, the grandfather of the current management, along with his three sons Richard, Edward and Raymond purchased the National Ammonia Co. from E.I. DuPont. Although Lawrence was active in the business, he immediately named his middle son, Edward, President of the company. At the time, National Ammonia Co. was an unprofitable, local cylinder distributor that operated out of a facility in Northeast Philadelphia. One of the first things Lawrence did after buying the business was to buy a flatbed truck to deliver the cylinders to our customers, rather than having to use common carriers to deliver them, and soon thereafter the business was turning a profit. In 1971 National Ammonia Co. acquired one of its major competitors, the Henry Bower Chemical Manufacturing Co., from Diamond Shamrock. Two additional purchases were to follow: Northeastern Ammonia Company was acquired in 1985, and Hamler Industries in 1991. In 1977 Tanner Industries, Inc. was formed as a parent to the operating divisions and is the name that the business operates under today. Edward Tanner ran the business until his death in 1984. At that time Richard, the oldest of the three sons had already retired from the business and Raymond was named President. Raymond ran the company until 1990 when he named Stephen "Brad" Tanner, the middle of Edward’s three sons who were active in the business, to the position of President, representing the third generation of Tanner management. Today Brad continues to run the business. 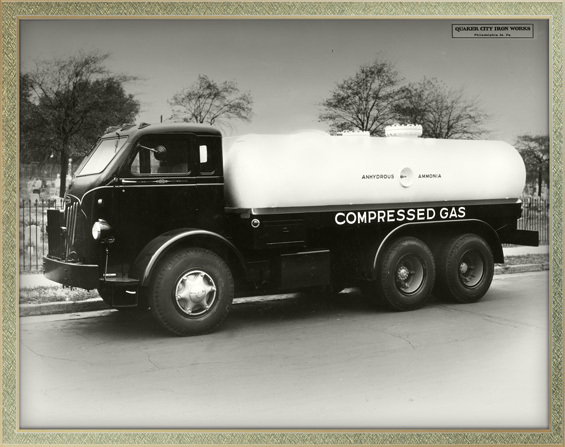 Since the purchase of National Ammonia Co. in 1954 the company has grown from that local Philadelphia cylinder distributor into one of the largest anhydrous and aqua ammonia distributors in the United States, selling its products in cylinders, drums, totes, l.t.l. bulk, full truckloads and rail cars. While we still operate locally out of that original plant in Northeast Philadelphia, the offices were moved to Southampton, PA in 1998 and we have added 13 additional plant facilities around the country. From these facilities we make upwards of 20,000 deliveries per year, 97% to 98% of which are made by our own drivers in our own equipment. We operate a truck fleet today that has grown from that original flatbed truck in 1955 to over 200 tractors and trailers.